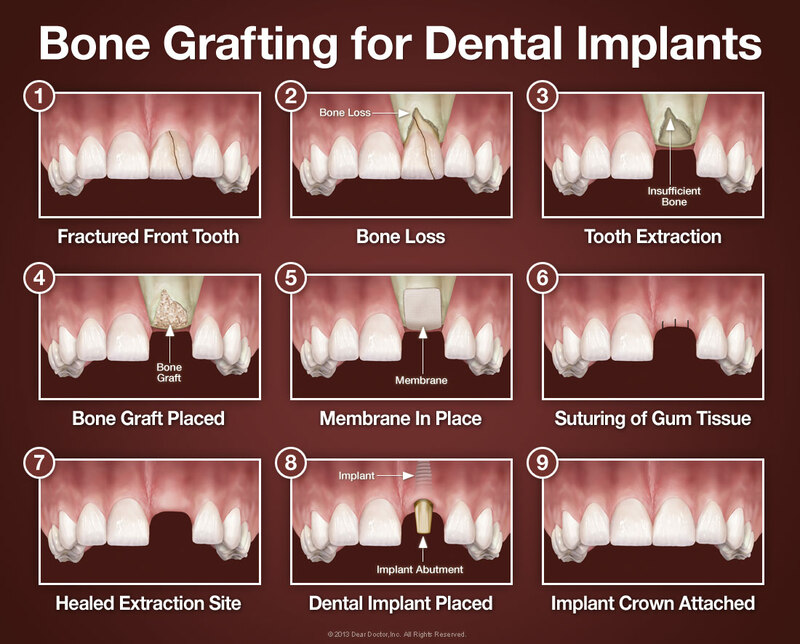 Bone grafting is a minor surgical procedure performed in the dental office under local anesthesia to rebuild bone in areas where it has been lost. Grafting material can be placed into a tooth socket as soon as a tooth is extracted, or in an area where a tooth has been missing for some time. Your body will then grow new bone cells, replacing this graft material over the next several months. Why would I need this procedure before getting a dental implant? A dental implant should last a lifetime. In order to do so, however, it needs to fuse securely to your jawbone. If you have insufficient bone volume there, your chance for success with dental implants won't be as high as it should be. Why would this happen? Bone quality and quantity almost always deteriorate when a tooth is lost, though you may not notice this is happening. Sometimes, by the time a person decides to have an implant placed, there may not be adequate bone left to ensure success. That's why we often need to place a graft first. That's also the reason you should replace a tooth as soon as possible and why many dentists recommend placing a bone graft at the time of extraction (View Step by Step Example). Where does the grafting material come from? It can come from a variety of sources, including your own body. These days, however, laboratory-processed bone from a human or animal donor (usually a cow), as well as synthetic materials, are frequently used. There are no safety concerns with grafting material that come from your own body. However, this method does have a disadvantage in that it involves creating a second surgical site — the place from which the bone is obtained. Mineral bone substitutes, whether they are coming from human donor bone or animal bone, pose little risk of infectious disease transmission as they undergo meticulous safety screening. Both have a similar level of risk, due to the extensive and rigorous processing the material undergoes at the highly reputable tissue banks used. This results in graft materials that have proven to be extremely safe. Also, you may be interested to know that mineral graft materials do not remain in the body but are naturally absorbed and replaced by your own bone over time. Bone grafting involves a small incision in the gum to gain access to the bone beneath it. Therefore, you may experience some post-operative soreness. Most people find this can be managed with ice packs applied to the jaw and over-the-counter anti-inflammatory medication and/or pain relievers. You should feel back to normal in a day or two. But at this point the bone-regeneration process will have only just begun. Over the next several months your body will continue to deposit new bone cells and remove the grafting material. Can my body reject the graft? No, because it does not contain any genetically coded or living material — only minerals. The sole issue is how much bone your body will make in response to the graft. If the appropriate level has not been achieved by the time the graft has healed, more grafting material can be added at the same time the implant is placed.